Cameron Wigmore and the Jazz Authority the jazz authority; random dubiously zappy rants about 'the musicians music'. Well, I haven't been updating all of my shows here on myspace over the last year, as facebook has proven to be a better way to get the word out about upcoming shows. I returned to the Port Theatre in January to perform with Sarah Wood, showcasing excerpts from her show "BC to Broadway". Last year I shared the stage at the Port Theatre with David Gogo. In January I organized a show with Pat Coleman and Ken Lister as a trio in Nanaimo BC. In February I'll be taking my funk band Jellycat back to the Cambie in Nanaimo. I'm also excited about a show this weekend in Victoria BC with the Jaco Pastorius Tribute Band led by Sean Drabitt on bass. Also in that show are Josh Dixon on drums and Brent Jarvis on keys. I'm hoping to perform at the 2011 Victoria Jazz Festival, showcasing my original music. I was there in 2009 with James McRae's project The Horace Silver Tribute Band, and again in 2010 with jazz vocalist Gillian Stone. In June of this year I will graduate from Vancouver Island University with Bachelor's Degree in Music. As part of my final recital I will be performing my original music. It's possible that I may take that music into the studio to record my first album. Another option for late 2011/2012 is touring the release of my CD. Taking it across Canada on a festival tour in the summer of 2012 would be a really amazing experience. So all of that, plus my regular gigs at local restaurants and clubs around Vancouver Island, a baby on the way (our second) and teaching, the day job, keeping grades up... WHEW! Please consider emailing a short letter to your MLA and the BC arts minister explaining why you support the arts and communicating that the BC Liberals will not receive your vote/support specifically because of their recent cuts. If you don't live in BC you can still speak up on behalf of the arts. Below are a few good statements about why the arts are important and worth supporting. Phoning the constituency office and emailing MLAs sends a message. Attending forums during elections and asking questions that put pressure on them is a good way to make them understand that we won't roll over when they try to destroy our livelihood. No other province has cut arts funding during this recession. Many provinces have actually increased funding, because it is proven that this is a form of stimulus that works for the whole economy, recession or not. Furthermore, the culture industry is a lucrative and growing industry, one that is quickly overtaking many failing traditional sectors. It needs seed investment; we cannot afford not to stimulate culture. Why in a recession are the BC Liberals saying they can't afford this negligibly small subsidy, when they are contradicted by all the available research, including their own?..." "...Could it be that the government needs to aggressively target spending in one sector to show that it's tough, that it won't blink as it protects the humble taxpayer from the ravages of this terrible economic downturn (so terrible that even this all-knowing government didn't see it coming)? Could it be that Gordon Campbell's cabinet has decided that arts groups must take this fall for the greater good of its claimed reputation for prudent fiscal management?..." One person's comments: "...People in BC still don't seem to get it, for the most part. Arts and Culture drive tourism. Without arts and culture (and boy, do we need to grow this sector, since it's one of the only healthy ones we have) the vacation planning conversation goes something like this: "Oh,Vancouver... you mean that place with the nice mountains - and oh, yes, really big social problems - way out there at the edge of the known world? No, not really. They have nothing going on of interest..."
The arts and culture sector is worth 5 BILLION (yes, that's right) to this province's economy each year. People seem to have this idea that arts spending isn't an investment. Well wake up, it is - from the most bare bones economics to the incalculable value of living in a civilized society and educating our children beyond being video-game playing boors. Economically, spending on arts and culture generates a return - A RETURN - of $1.38 for each dollar spent. Artists are not looking for handouts. They are some of the hardest working and most underpaid workers we have. They give far more to communities than many of the things that people like to think deserve support. The auto-workers, corporations and now the forestry sector, all think a hand-out from the government - OUR money - is a good thing ... Why not invest in a sector that still works, even in a bloody recession, one that gives a return? The arts aren't a luxury - they are a necessity, as any short survey of civilizations and even tribal communities will reveal. WAKE UP people!..." Tell the politicians that they will never get our support because of their actions. was a woodpecker peckin' at a plastic tree. "Things ain't as sweet as they used to be." Thanks to Andrea Adams for this great video! More music by this band can be heard at their myspace page. The October 20th evening concert at the Knox United Church in Parksville, British Columbia, was a “must see” for serious jazz fans and musicians of any and all kinds. 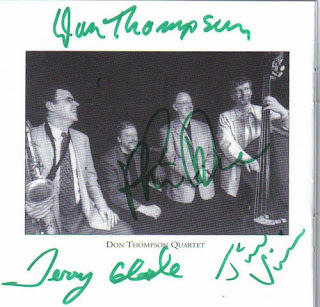 The material performed was entirely original compositions by Don Thompson. Over the course of two sets, lasting about 45 minutes each, the audience was treated to a night of some of the very best Canadian jazz in existence. With a band comprised of Don Thompson on vibes and piano, Phil Dwyer on saxophone and piano, Terry Clarke on drums and Jim Vivian on the upright bass, one would expect to see a venue full of keen fans eager to be hit with a night of fantastic jazz compositions and improvisation. The audience seemed as serious about the show as the performers, yet there was a sense of playfulness and calm in the demeanour of everyone in attendance, including the performers. It was a rare treat to have the opportunity to hear this band live. These musicians are all award winners, and their collective effort has produced two CDs. The CD entitled Ask Me Later, (CBC Records) – was released in 2005 and won a Juno award in 2006 for best traditional jazz album. The recent CD entitled For Kenny Wheeler (Sackville Recordings) was recorded, produced and released in 2008. This tour was tied into the release of the second CD. No concert review would be complete without a thorough description of a number of the pieces that were performed. Two that stuck in my mind were Another Rainy Day and Hot Chocolate. Interestingly, both were recorded on Ask Me Later, but not on For Kenny Wheeler - the album they were touring. Another Rainy Day is a ballad, with the meter often switching between 4/4 and 3/4 time. Unless you’re looking for the changes in meter, it’s unlikely that you’d notice them. The collective feel and level of communication between the band members is so comfortable that the music just seemed to flow with little thought or effort. As the band performed this piece a hush come over the crowd. The audience gave the musicians their full attention, and I can’t recall listening to a ballad performed live where the entire room was so captivated by the music. As I listened to Don perform on the vibes (Phil Dwyer was at the piano for this piece) I noticed that the rest of the band wasn’t just supporting him as the soloist; they were actually creating a great deal of rhythmic complexity at points where the energy in Don’s solo peaked. Jim Vivian and Terry Clarke were in nearly constant contact with each other visually, which is a great way for them to ensure that they are constantly paying attention to what the other one is doing. Not only was the composition so wonderful that I decided to ask Don for the score the next day (which I did and he graciously provided to me only a few days later, while they were still on tour!) but the level of skill with which it was performed was so high that it left me feeling a richer person for having witnessed it. The stage presence of Don Thompson is certainly unique. With a gentle and relaxed demeanor he introduced the members of the band and the individual pieces, and his stories behind the music were always entertaining, adding to the experience of attending the show and hearing the music performed live. While Don Thompson’s introduction to Another Rainy Day was funny (“while in Banff it rained every day except for one… and it rained that day too!”) the way he introduced Hot Chocolate was perfectly appropriate in its simplicity. Knowing that his audience was fairly hip, Don explained that this piece was based on the changes to an old jazz standard entitled Cherokee. He altered the bridge to include some chord changes borrowed from John Coltrane’s Giant Steps, but the resolution ended up in a key different from the rest of the piece, so he did the most obvious thing: he wrote the last section in a different key, with a short turnaround (a set of chord changes) to take it back to the top of the form and the original key. While that might sound straightforward, and the musicians were perfectly comfortable with the composition, it’s the opinion of this musician that one would have to be either a sucker for punishment, a show off, or an extremely accomplished improviser to want to attempt to play this music! The tempo was quite brisk at over 200 beats per minute, and the level of musicianship in this ensemble was again apparent. Throughout the solos the rhythm section provided a steady platform for improvisation. Phil Dwyer played saxophone for this tune, and when it was his solo I could tell I was in for a treat by the way Terry Clarke and Jim Vivian were locked in with each other. Not only did Phil Dwyer provide musical material for the rhythm section to pick up on and make use of (which they did handily) but each of the other performers offered up rhythmic, melodic and harmonic gems that each person managed to capitalize on in some way, nearly every time. The level of listening and communication was unbelievably high. It was an inspirational experience that will stick in my memory for a very long time. This is a video from the Horace Silver tribute band I'm playing with. See more at my Youtube profile. Topic: The influence of classical music and early African American folk music on the development of jazz in the 1950s and 1960s. Two jazz genres – third stream jazz and hard bop – grew simultaneously in opposite directions during the late 1950s and early 1960s. The post-bebop jazz style called symphonic jazz or alternately “Third Stream” jazz is an example of acculturation, significantly influenced by classical music. Conversely, a new subgenre of bebop called hard bop used the more traditional folk elements of gospel and blues music. Each of these genres was of tremendous importance to the development of jazz. In the late 1950s and early 1960s bebop evolved in two main directions, with many subgenres. One path – cool jazz and then third stream - involved the increasing influence of Western European art music (classical). The other – hard bop - was a response to this process, with increasingly present early African American folk, gospel and blues influences. In the decades prior to these events, popular music had moved away from the big band jazz of the 1930s and ‘40s. Musicians had become bored and created a kind of jazz called bebop. Several jazz movements followed swiftly in the wake of bop and revivalism. In quick succession came cool jazz, hard bop, West Coast jazz and Third stream jazz. At this time – the late 1940s – the beginnings of free jazz were also first heard. Each genre did not displace or eliminate the preceding ones. Throughout jazz history, new styles run alongside their predecessors, so that today one can hear a wide variety of jazz types, all coexisting. We can, to a limited degree, observe the influence of jazz on Western classical music. European composers began to encounter ragtime related styles around the turn of the century, usually through published sheet music, and soon started to write pieces that made reference to its syncopated rhythmic patterns. In the early 1900s classical composers began to hear jazz on record and in performance, and many were inspired to compose music that incorporated elements of jazz. Among the most successful of these efforts were Copeland’s Music for the Theatre (1925) and Piano Concerto, and Dmitri Shostakovich’s Suites for Jazz Orchestra (1934). The direct influence of jazz on classical music proved to be a passing phase of modernism, and was already fading by the 1930s. In 1924 George Gershwin, a classically trained pianist and popular songwriter who was familiar with jazz, composed Rhapsody in Blue, a concerted work for piano and the twenty-three piece “jazz band” of Paul Whiteman, then the most influential large dance band in America. The piece was scored by Ferde Grofe, Whiteman’s pianist and chief orchestrator, who also had extensive classical training. Examples of jazz versions of classical compositions that were popular in the ‘30s and ‘40s include Tommy Dorsey’s “Song of India (after Rimsky-Korsakov, 1937), Art Tatum’s “Humoresque” (after Dvorak, 1940) and King Cole Trio’s “Prelude in C Sharp Minor” (after Rachmaninoff, 1944). These attempts at jazz arrangements of classical compositions can be said to have trivialized the original material on which they were based, and may also reflect the desire of class-conscious jazz musicians to prove their “legitimacy” at a time when jazz was not regarded as art music. Gil Evans is the only arranger of the period who consistently succeeded in creatively “recomposing” classical music. Gil Evans is a good example of a third stream musician, as his compositions regularly featured orchestral instruments, highly arranged sections and song forms borrowed from classical music. He was also instrumental in the creation of Cool jazz, a direct precursor to third stream jazz. On the other hand, some jazz composers, such as Dave Brubeck, wrote pieces specifically for classical musicians to perform. These attempts were considered by many to be failures, largely because they failed to attract a large audience. This may reflect a practical problem of stylistic integration which is common to third stream music: most classical musicians unable to improvise and they find it difficult to produce in performance the unwritten rhythmic nuances unique to jazz. From the first days of recorded jazz there had been attempts to combine it with classical music. In the twenties, Bix Beiderbecke and others had expressed admiration for the work of Ravel, Debussy and Delius. In the thirties, Artie Shaw had experimented with the use of a string quartet. At around the same time, Benny Goodman had begun a courtship with classical music that was to endure until he died in 1986. With Leonard Bernstein at the piano, Goodman had premiered Poulenc’s Clarinet Sonata in 1963. Goodman’s efforts would result in a profusion of commissioned works, from Malcolm Arnold, Bela Bartok, Aaron Copland, Morton Gould, Paul Hindemith and others. The Woody Herman band gave the first performance of Igor Stravinsky’s Ebony Concerto in 1945. Duke Ellington and John Lewis utilized classical techniques in their jazz writing during the 1940s. Beginning in the 1950s, there were many such cross-references. Numerous jazz musicians cite classical music as an important part of their listening. Duke Ellington started with classical music. When interviewed by the influential Belgian critic Robert Goffin, in 1946, (Goffin, R., Jazz, From Congo to Swing, 1946, p. 263) he said, “I’d take Ravel’s Daphnis and Chloe; Delius’ In a Summer Garden; Debussy’s La Mer and Afternoon of a Faun; and the Planets Suite [Holst]…” The connections have been there all along. The expression Third Stream was coined by the historian Gunther Schuller, in an address at Brandeis University, in Boston, MA, in 1957. It was originally used to describe a style that fused basic elements of jazz and Western art music. In many jazz histories you will not see Third Stream mentioned. Schuller himself admits (‘Third Stream’, The New Grove Dictionary of Jazz, 1991, p.1199) that the movement has “attracted much controversy and has often erroneously been allied with the symphonic jazz movement of the 1920s.” However, the significant difference is that the symphonic jazz movement first emerged in the 1920s, before Third Stream jazz was identified and defined. Although it displayed an awareness of American song and dance, symphonic jazz lacked the crucial element of improvisation. In an exploration of the influence of classical music on jazz, third stream jazz signals the reappearance of the earlier effort, under the name of symphonic jazz, to change the direction of jazz music through increasing influence of Western European classical music. With his documentation of the first appearance of the term (N. Slonimsky, Music Since 1900, 4th ed., 1971, p.1497) Slonimsky provides the following definition: “If the first stream is classical and the second stream is jazz, Third Stream is their Hegelian synthesis, which unites and reconciles the classical thesis with the popular antithesis.” Examples of third stream thinking came from Gil Evans, Stan Kenton, George Russell and Gunther Schuller. In the 1950s many jazz musicians were studying classical composers from Bach to Bartok in an effort to grow musically. Classical musicians were listening more seriously to jazz and taking a professional interest in it. The ideological and technical barriers between jazz and classical music were beginning to break down. The presence of musicians who were comfortable and capable in both jazz and classical styles was very important to the development of third stream music. It was the appearance of musicians who could bring together improvisational skills and the sense of timing found in jazz performance and the disciplined requirements of Western European fine-art music that differentiated the third-stream movement from earlier attempts – such as the symphonic jazz efforts of Paul Whiteman - to fuse the two idioms. Because of the emphasis placed on the composed element of third stream music, many of the early experiments lacked the quality of spontaneity and the rhythmic flexibility that was so much a part of the jazz tradition. The initial discovery of jazz by European and American fine-art composers in the twenties resulted in superficial borrowings from jazz in an otherwise European context. These efforts were restricted by the limited knowledge and understanding of jazz on the part of composers and by the absence of performers who could meet the demands of playing in both styles. The role of improvisation was nonexistent. The main differences between third stream music in the 1950s and ’60s and previous efforts to westernize jazz were that third stream music began to include improvisation and we now began to see both classical music and jazz coming together on an equal basis, with jazz adopting elements of classical music and the latter adopting harmonic and rhythmic elements of jazz as well. Third stream is actually a jazz term that describes the use of classical music models in jazz music rather than an assimilation of jazz elements into the classical model. Musical forms employed in Third stream music include the fugue, canon, and theme and variations, borrowed from classical music. Third stream jazz puts less importance on rhythm and more focus on harmonic and melodic development, and for that reason some hold the view that third stream music is not jazz. Yet another approach to third stream music is the actual use of classically composed music in a larger jazz work or the complete statement of a classical work with jazz interpretation. The Swingle Singers used many Bach pieces, and Hubert Laws recorded Stravinsky’s “Rite of Spring”. Although third stream jazz was not a strong force after the 1960s, classical music continued to interact with jazz as the avant-garde school of jazz emerged. Other applications of third stream techniques are seen in the use of the “jazz suite” by artists who did not necessarily want to be associated with the third stream movement. Third stream music has been written and performed to this day by artists such as Charlie Haden, Carla Bley, Randy Weston and Melba Liston. A wider definition, as proposed by Schuller, might include fusion and world music. It could be argued that since it is often impossible to classify certain music as jazz, classical, popular or ethnic, proof exists that the third stream effort to fuse these kinds of music has been at least somewhat successful. While third stream music developed and showed increasing influence by Western art-music, a new subgenre of bebop called hard bop emerged. Hard bop, as its name implies, is a development of bop. They come from similar influences, and to those unfamiliar with jazz they sound alike. Also known as soul jazz and funky jazz, hard bop appeared around 1954, on the heels of the institutionalization of the cool style. Its proponents were mainly concerned with reaffirming the features of bop that were cast aside or minimized by the promoters of the cool style, features that can be summarized as the musical “blackness” of jazz. Cool jazz was associated with white Californian musicians, though not exclusively so. Hard bop was more typically played by musician from Detroit, Philadelphia and the East Coast, and it used traditional African American folk elements of gospel and blues music. Hard bop was typically performed in small combos, usually with more than one front line instrument, the musicians playing arrangements with organized introductions and codas. The tenor saxophone was featured heavily. Pianist Horace Silver was an important figure in hard bop, leading a series of quintets with trumpet and tenor saxophone front line. Many of his compositions are examples of the breaking away from the bop practice of using chord progressions from standards. Hard bop favoured a more powerful instrumental tone, simpler arrangements with little counterpoint, and a more driving solo style. Rhythmic density was typical of hard bop, which was both close to the black popular tradition and eventually influenced by a number of musical influences (Asian, Caribbean, French impressionist). Heavier use of the minor mode, strong rhythmic patterning, slower tempos, and blues & gospel-influenced phrasing and compositions were all characteristic of hard bop as it emerged in the mid-fifties. As practiced by black jazz artists, hard bop represented a return to basics, a return to the emotional content of earlier jazz, and a disregard for the “European” mannerisms of the rival style. It was strongly influenced by the “gospel” music of black Protestants and its rhythm & blues counterpart in entertainment music. The “gospel” sound was achieved by the frequent use of open fourths and fifths, the presence of the IV – I cadence and repetitive melodic units (recalling the riff). Off-beat accentuation was the characteristic rhythmic style trait. Hard bop jazz artists used complex polyrhythmic structures and manipulated rhythmic details in ways that were unknown to any earlier period in the history of jazz. In the thirties it could be argued that jazz and urban black pop music were one and the same. It was only in the late forties with the arrival of bebop that the two categories began to diverge more radically. In the early fifties people were asking what direction jazz should take. Bebop, which had begun as a promise of freedom, had turned into something of a straightjacket, an increasingly specific form of expression. R & B might be a source of new ideas, but it was too limited to satisfy jazz musicians as a regular context. Gradually the outlines of a new style – hard bop - began to emerge in the music of trumpeter Clifford Brown, saxophonist Sonny Rollins, pianist Horace Silver, drummer Art Blakey, Benny Golson, and the Cannonball Adderley Quintet. Other prominent players in the style included Sonny Rollins, Stanley Turrentine, Joe Henderson, Wayne Shorter and Yusef Lateef on tenor sax; Kenny Dorham, Lee Morgan and Freddie Hubbard on trumpet. While musicians like Brown, Silver, and Blakey were all accused of playing “simplified” versions of bebop, each of them found a personal voice by taking what had been done in the late ‘40s and mixing it with more popular elements. As a result, jazz regained a measure of acceptance in black neighbourhoods and renewed its connection with dance inspiring rhythms. Hard bop also allowed for the expression of a set of emotions that in general had been little explored in jazz. These new dimensions included defiance and bitter sarcasm. Hard bop was a fusion of black pop culture’s self affirming qualities and intense physicality with “art” of the most demanding kind. Interestingly, hard bop was bitterly attacked by many jazz critics at the height of its popularity. Social elements surrounding both the influence of western European music on third stream jazz and the conscious effort by some jazz musicians to move away from those influences and toward hard bop and its African American roots cannot be ignored in the exploration of these subjects. In many cases the music critics - arguably operating under a Western European musical value system - largely praised third stream music for its refinement and “respectable” nature. These same critics simultaneously denounced hard bop, free jazz, and any other kinds of music where African Americans could be seen to be politicizing their music, making a determined effort to reintroduce more traditional African elements of music, or reaffirm their African American heritage through the introduction of gospel & blues elements to jazz. The overall failure of the third stream concept to engage the interest of more than a small number of major jazz soloists also suggests the possibility of an underlying incompatibility between jazz improvisation and organized classical music. Considering these differences it seems probable that jazz and classical music will continue for the most part to travel on related but independent stylistic paths. Jazz music and all of its subgenres would not exist today if it wasn’t for the defining events and processes which it has experienced throughout its history. In the preceding paragraphs this paper has explored a small segment of the history of this diverse and hugely important form of music. This paper has focussed on both the continuing influence of Western European art-music on jazz and the specific point in time – the late ‘50s – at which jazz music split into the two distinct main genres of hard bop and third stream music. While one sub-genre could be said to have a more obvious association with classical music, both styles are bound by certain confines. Nearly all jazz is influenced to some degree by classical music, if only because it is normally organized according to the rules of functional tonality. - Providing information on the subjects of hard bop and third stream jazz. - Information on the origins and elements of hard bop. Jazz In The ‘60’s; M. Budds, U of Iowa Press; pg 11, 71-79. - A brief summary of hard bop and an exploration of the influence of classical music on jazz in the form of third stream jazz. - Paragraph from an article by Gunther Schuller exploring the reasons behind the mixing of jazz and classical music. - The roots of Hard Bop and other related information. - Exploration of the fusion of jazz and classical music in the ‘50’s. - social elements surrounding both the influence of western European music on jazz (third stream) and the conscious effort by some jazz musicians to move away from those influences and toward African American roots (hard bop). - Details about the earliest efforts to “Westernize” jazz by Paul Whiteman. - A history of the mixing of African American and Western European music throughout the 20th century. Sometimes we arrive at places we never meant to visit, like the time I was on the subway in Toronto and decided to get off one stop early. I walked the rest of the way, passing unknown shops and unfamiliar landscapes as I navigated my way home over the next thirty minutes. Something similar happened in the way I arrived at the point of reviewing The Growing Season by Rebecca Martin, and the experience has proven to be just as interesting and rewarding. So here goes my very first CD review ever. For The Growing Season, Rebecca Martin has brought together some fantastic musicians. The personnel includes drummer Brian Blade, bassist Larry Grenadier, guitarist Kurt Rosenwinkel (also heard here playing piano, Fender Rhodes and vibraphone), and Rebecca Martin herself on Vocals and Acoustic Guitar. The easy flow in the music shows that on this project these musicians are very comfortable with each other. Coinciding with the release of this CD, the same ensemble appeared with her for a week at the Village Vanguard in August 2008. The twelve songs are all originals written by Rebecca Martin. The first track, “The Space in a Song to Think”, sets the pace for the CD with its introspective and personal lyrics. I enjoyed the positive message. As the first track a declaration is offered in the lyrics: “Let this be learning, that we’re all allowed to take what we need and to give what is needed”. The feel on this track is upbeat but relaxed, with much credit going to Brian Blade for his tasty accompanying. The second piece “A Million Miles” could very well be a modern standard, and may, in time, become one. The lyrics and melody are expertly crafted, and as a performing musician I’m quite interested in taking a closer look at the chord changes for this beautiful ballad-like composition. The remainder of this CD is equally as enjoyable. Every track tells a different story, and each one has a unique feel and sound, yet it all fits together very nicely. From the flowing 3/4 (jazz-waltz) feel and self affirming message of “To Prove Them Wrong” to the pulsing beat and darker subject matter in “After Midnight”, this CD – her eighth release - is an enjoyable way for one to discover this artist’s work. One needs to listen to a few tracks of this music to know what the “sound” is. I could use a few descriptive genre words around, such as “jazz-pop”, or “mellow acoustic vocal folk-jazz”, but those empty descriptions will only serve to categorize a piece of personal art, doing a disservice to the prospective listener by placing Rebecca’s masterful creation in a box meant to make consumption easier. My point is that it’s worth a quick visit to her website to hear a few excerpts of tracks prior to deciding whether or not her “genre” fits with one’s own personal preferences. When this disc fell through my mail slot I confess that I was feeling indifferent towards the idea of reviewing it. The promoter asked me to review it... I'm still not sure why they asked me. I popped it into my player and passively listened to a couple of tracks while I shuffled about my house, until the unexpected yet comfortable mix of familiar sounds and unique harmonies had me sitting by my speakers reading the lyrics and liner notes. Having only recently rediscovered the joys of buying CDs, this experience inspires me to recommend venturing out to your local record shop to purchase an album… maybe an act to be undertaken without first knowing which CD you’re going to take home, or which route you’re going to take to get there. In the same way that the 2003 release Alegria by Wayne Shorter made its way from the record shop on Whyte Avenue in Edmonton to the top of my frequently played lists via one of my meandering afternoon walks, this release has caught me by surprise. Interestingly, Brian Blade plays on both recordings. I wasn’t too keen on highly arranged orchestral jazz prior to hearing Alegria. Similarly, I would likely have never purchased The Growing Season, considering that it is listed under “soft jazz vocals”, whereas I’m normally looking for 1960’s Hard Bop. Both CDs have been a learning experience that has opened up my ears to a wider spread of music. Thank goodness for unintended visits to unexpected landscapes, and soundscapes. I'm very excited to be playing two dates with this band! Horace Silver is one of jazz music’s unsung heroes. Nanaimo musician James McRae aims to do something about that. An octet of veteran jazz performers has coalesced around McRae’s concept of a Horace Silver Tribute evening. The Message will perform Silver's music in Courtenay at the Elks’ Home on Sunday November 2nd. Silver turned 80 this year, and has nearly 6 decades of continuous performance, composition and arranging to his credit. His best-known compositions include Song For My Father, Doodlin’ and Sister Sadie. Diverse performers such as Nora Jones, Taj Mahal and Steely Dan cite the influence of his music and sensibility on their own style and material. The concert will be an entire evening of Silver’s evocative compositions, featuring arrangements by several different members of the group. the jazz authority; random dubiously zappy rants about 'the musicians music'. Jazz Authority was created for the purpose of sharing knowledge about music theory, saxophone technique, and for discussing music in general.